Forget James Bond — how about we get Idris Elba to be the next Batman? Or the next Superman or the next Flash? 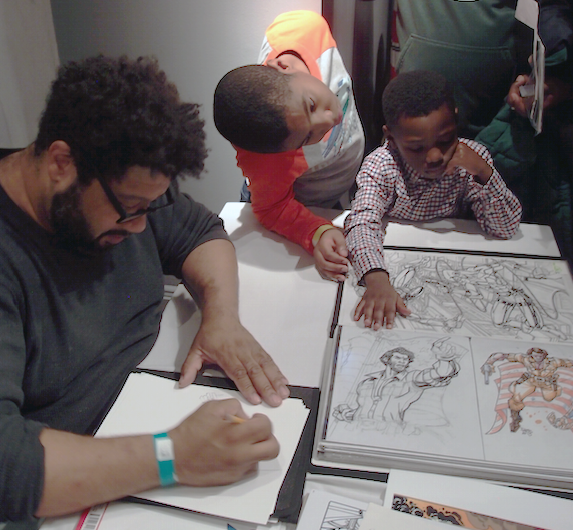 Questions like these were in the air on January 16 as an estimated 5,000 comic book lovers — and their kids — squeezed into the 4th annual Black Comic Book Festival at the Schomburg Center in Harlem. Although this festival is much smaller than the major ComiCons, it was filled to capacity all day long. 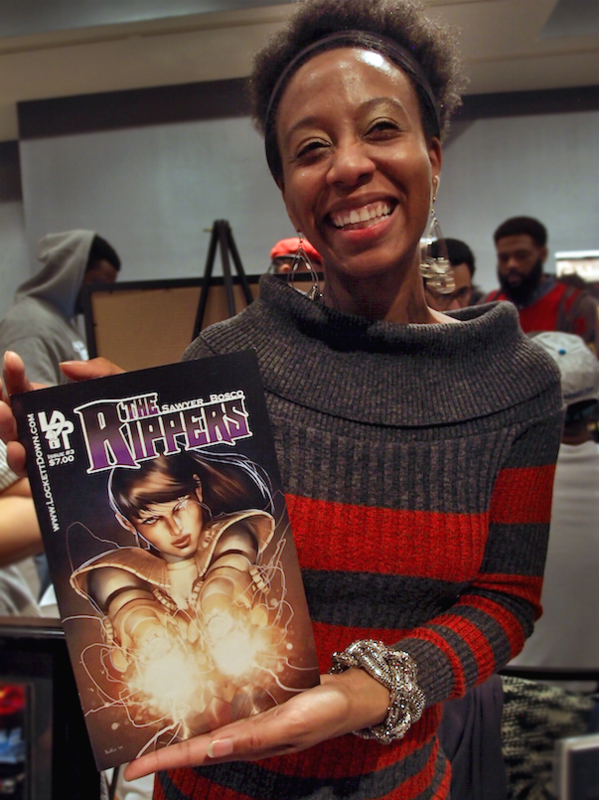 There were more than 35 exhibitors and more than 75 artists and writers, and several excellent panels were held throughout the day on topics as diverse as the pros and cons of self-pubishing, terms like “blerd” (black nerd) and “bleek” (black geek), and how women fit into an industry that has historically objectified them. 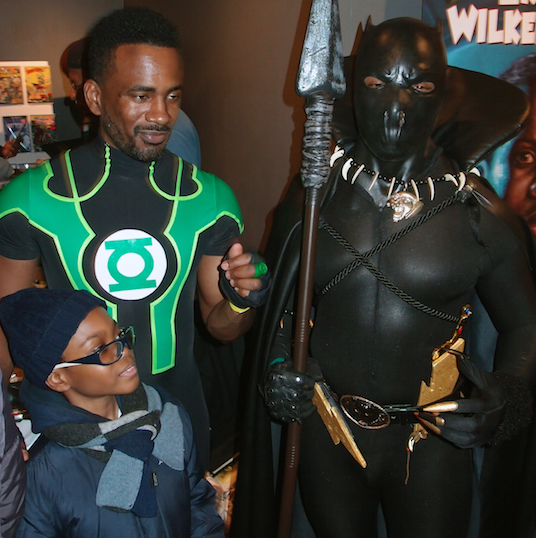 Everywhere you turned you would see kids posing for pictures with men dressed as Green Lantern, the Black Panther, and the most famous black vampire since Blackula – Blade. 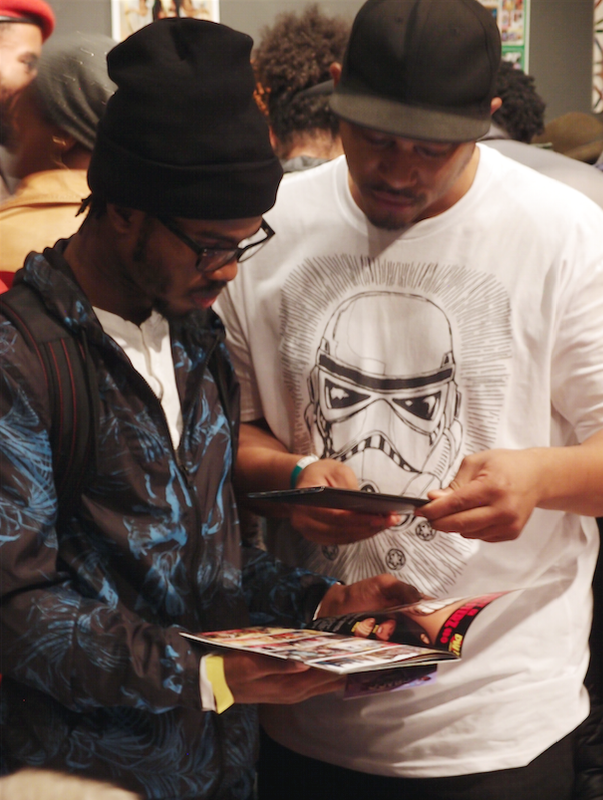 Some notable artists present were DMC from Run DMC, a self-described comic nerd who — fun fact — sold part of his childhood comic book collection to buy his first turntables; Guy Sims, writer of the very popular series BrotherMan; and Paris Cullins, renowned artist and writer for Marvel and DC. Paris Cullins draws a picture for Bryce & Josiah Adetunji. There were also many interesting independent artists with their wares on display, selling everything from t-shirts to buttons to posters. A standout was a poster made by (H)afrocentric of a woman climbing a flagpole in order to replace the confederate flag with a Jamaican one – she was drawn like a superhero, and she was sporting an resplendent afro. It was a smart way to reference Brittany “Bree” Newsome’s removal of the flag at South Caroliina’s state capitol last summer. A gaggle of young girls drew me over to the Women in Comics (WinC) table, which also boasted a variety of posters, shirts, and comics. WinC was formed to bring attention to female writers, illustrators, and publishers — an important goal in a field long dominated by fanboys. Founder Regine Sawyer was talking to the girls, most of whom were wide-eyed, telling them about WinC’s work and its own upcoming comics convention at the Bronx Library on March 19. Near Sawyer I ran into Lion Forge Comics editor Adam Staffaroni. He was chatting with Whit Taylor as she showed him copies of her series Madtown High. After she completed the series, which she both wrote and illustrated, she upped her game with a book called GHOST, which, she told us proudly, had sold out of its first printing. 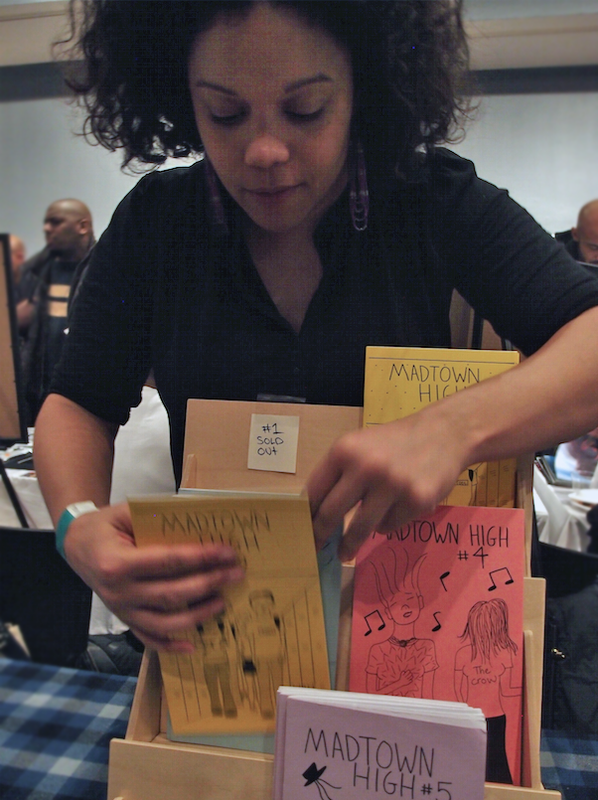 Whereas Madtown High is a stapled zine illustrated with line drawings, GHOST is a book in full color. It reminded me of the early work of Gabrielle Bell, who is now a regular on the comic book circuit. As with Bell, it’s always exciting to see an artist — in any medium — pushing her own boundaries. Later, well-known comic artist and filmmaker David Walker summed up an important thrust of the event for me. “You realize illiteracy for teenage boys is at an epidemic level?” he said. “Just look at Twilight. And you wonder why they don’t want to read!” But now, thanks to Walker and his ilk, people of color are being represented in comic books and movie adaptations more than ever. Young boys (and girls) of color now have heroes of their own who actually look like them! That will definitely keep them reading — and turn them into lifelong comics fans. 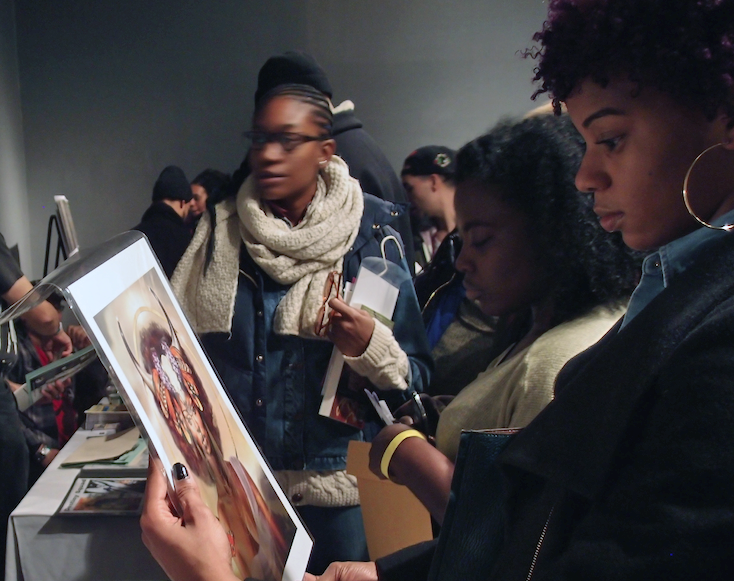 The 4th annual Black Comic Book Festival took place at the Schomburg Center for Research in Black Culture (515 Malcolm X Boulevard, Harlem, Manhattan) on January 16, 10am–7pm.